Located on the south wall of Elmwood Equipment at 117 North 4th Street. 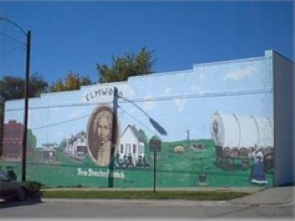 This mural was funded by Elmwood-Murdock FBLA and was painted by Geoff and Echo Easton in June 2000. Explore Elmwood’s history by interpreting the pictures on the wall.